A quadratic function may be easily sketched by finding just a few points. The most important part of the quadratic function is its vertex. Recall that the x-value of the vertex of the quadratic function, f(x) = ax² + bx + c, can be found by applying the formula, x = –b/(2a). Quadratic functions may be sketched by finding the vertex and by finding at least two points on either side of the vertex. By finding these five points, you will always end up with a nice "∪"-shaped curve. Graph the function by finding the vertex and two points on each side of the vertex. The formula gives the axis of symmetry and the x-value of the vertex. In this case, a = 1, b = –2, and c = –3. The vertex is found by substituting x = 1 into the function, f(x) = x² – 2x – 3. The vertex is at the point (1, –4). This is the lowest point on the graph. Now, go to your Table of Values and determine two points to the left of the vertex and two points to the right of the vertex. The formula gives the axis of symmetry and the x-value of the vertex. In this case, a = 4, b = –2, and c = 0 . The vertex is at the point . This is the lowest point on the graph. Determine the function shown in the graph above. The vertex form for a quadratic function is f(x) = a(x - h)2 + k, where the vertex is at the point (h, k). The function is f(x) = a(x - (-1))2 + 4 for some value of a. 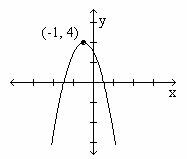 When the parabola opens upwards, the value of a is positive. When the parabola opens downwards, the value of a is negative. In this case, "a" should be negative since the parabola opens downward. A ball was kicked into the air from a balcony 20 feet above the ground, and the ball's height above the ground, in feet, t seconds after the ball was kicked was h(t) = 20 - 16t2 + 32t. What was the maximum height, in feet, of the ball above the ground after it was kicked? The equation h(t) = 20 - 16t2 + 32t is equivalent to h(t) = 20 - 16t(t - 2). It follows that h(t) = 20 when t = 0 and t = 2. Thus the maximum value of this quadratic function occurs when t is halfway between t = 0 and t = 2, which is when t = 1. Therefore, the maximum height, in feet, of the ball above theground after it was kicked was h(1) = 20 - 16(1)2 + 32(1) = 36. Determine the vertex of the quadratic function. The x-value for the vertex is . To find the y-value for the vertex, evaluate f(-2). The vertex is at the point (-2, -36).